I am hosting my March Give A Way. It will end March 31st so that will give a lot of people time to enter and me time to add surprises to it. I will have your package packed full of goodies and surprises. IT IS AN APPLE THEMED GIVE A WAY. All you need to do to enter is. 1. Add my blog to yours. If you do not have a blog it is OK TO ENTER.. But if you do then please add me. 2. Blog about the give a way on yours if you have a blog. 3. Include your email address/blog address in your entry. That is so I can contact you if you win and also I am looking for blogs to add to mine everyday. 4. Be sure to pass the word on to a friend. I will accept the honor system on this one. THANK YOU AND I HOPE YOU WIN!!! Someone contacted me that did not have a blog.. FEEL FREE TO ENTER IF YOU DO NOT HAVE A BLOG.. Here are just a few of the things in the Give A Way. Hi! I am going to add you to my blog list and post about your giveaway, what fun, thank you! What a great giveaway! I am adding you to my blog list and posting about the giveaway! I love your apple theme…I will definitely post about your giveaway and add you to my blog. You all are entered. There will be more things added as surprises to this give a way.. SURPRISES! Melt chocolate in saucepan. In a mixing bowl, beat eggs and sugar together. Stir in the melted chocolate until thoroughly mixed. Add the sugar, flour, and baking powder. Then stir in the apple pieces, nuts and vanilla. Bake in an 8-inch square pan at 350F for 30 minutes. Oh my goodness.. that sounds so good.. I read something once that said that by eating an apple day it works both ways.. Adds fiber to your diet and makes you do what you have to do or if you go to much it works just the opposite. I used to never eat an apple because of something happened when I was a child. I need to blog about my one time crime at about age 6. But now I eat an apple, tiny bit of walnuts and a small piece of cheese every night. And about you adding chocolate.. Hey I see nothing wrong with that! It is good for the heart! I am going to try this recipe. I will substitute 1/2 c of Splenda for the sugar. Just to keep the glucose in check. I am an apple-person! Fortunately I get fruits for free at my job (at the University of Agricultural Science, Uppsala, Sweden) so I have at least an apple a day. I have started to make some kind of apple-pie wallhanging, and when I saw this giveaway it struck me, where did that project go? As most quilters I love to start new projects, but it is harder to finish the ones who has been laying around for years … but sometimes I go through the pile of unfinished projects and choose one which I then most of the time actually finishes. Agneta, Thank you for emailing. I am glad you entered. I like apple’s as well. I will check your blog and add to mine. I don’t have a blog, but I certainly would like to win. I love that little box/case! And the fabrics look fab! What a nice surprise to see my ‘B’ card on your blog! Okay, I don’t have a blog, not even a cell phone, other than a computer and digital camera, I am very technologically challenged. I am in , I will link you to my blog! I love your blog Chris. You are one busy woman. I have a big bottle of Aleve in my medicine cabinet if you ever need to borrow some for your poor “stuck” fingers. Best wishes and Good luck with your business. 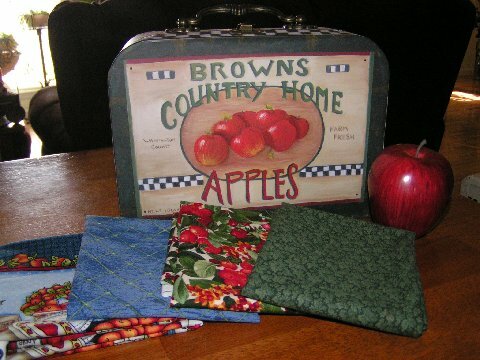 Great giveaway – Apples are wonderful. I wil link you to my blog. What a lovely giveaway. Just one entry for me please. I’m off to have a good look at your blog. What fun! I am trying to start a blog, but don’t know enough about it yet. I will tell my friends to read yours tho. Don’t know how I missed this giveaway before…I subscribe via the feeds! Nice theme of gifts you have for a prize. I haven’t a blog or anything but would like to be included. I read you blog faithfully via the feeds. Hi, great giveaway! Love the fabric! Hope I win.. keeping my fingers crossed. Wow, it has been a month since my first entry….time does zoom by! Thought I’d say HI again, and add that I wanna win…. !